A Maine woman was arrested and charged with sending Senator Susan Collins (R-ME) a threatening letter to the lawmaker’s home in October after the Kavanaugh hearings. In October, a local hazmat team was dispatched to investigate a suspicious letter sent to the home of Senator Susan Collins and her husband Thomas Daffron. An affidavit filed in U.S. District Court in Bangor says 37-year-old Suzanne Muscara of Burlington mailed starch to Collins’ husband, Thomas Daffron, reported the Miami Herald. Senator Susan Collins made headlines after she gave a historical 45-minute speech from the Senate floor before announcing she would vote yes to confirm Brett Kavanaugh to the Supreme Court. Collins said his opponents have missed the mark on Judge Kavanaugh. The Maine senator then proceeded to praise Judge Kavanaugh on his previous decisions. The attacks on Brett Kavanaugh were all lies made up by the left, promoted by ranking member of the Senate Judiciary Committee Dianne Feinstein, then pushed out to the masses by the lying media. The ‘loving and tolerant’ left responded to Collins’ support of Brett Kavanaugh by sending the Republican lawmaker a threatening letter. Federal prosecutors are asking Muscara be held without bail — she faces up to 10 years in prison. 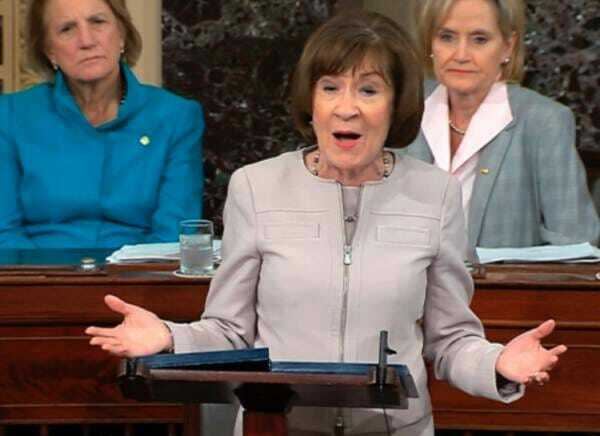 The post Maine Woman Charged With Sending GOP Sen. Susan Collins Threatening Letter – Faces Up to 10 Years in Prison appeared first on The Gateway Pundit.